Sewing your own clothes is a way to create a personalized wardrobe while often saving money over store-bought clothing. For the beginning seamstress, there are a lot of new things to learn. One important skill is calculating the yards of fabric needed for your sewing project. This information can be easily attained when you understand how to read the information given on a pattern envelope. 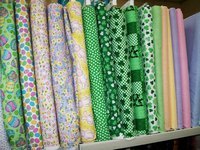 Determine the pattern you will be using for your sewing project. Many patterns have several styles or views that can be made from the same pattern. Choose the style you want to make. Look at the back of the pattern envelope and find the measurement chart. Take your body measurements. Depending on the garment you are sewing, there might be different body measurements needed. The pertinent measurements will be listed in the chart on the back. Identify your size from your body measurements using the chart. If you are between two sizes, use the larger size. Match your size with the style on the pattern you will be sewing. There will be two numbers listed for yards of fabric—one for a 45-inch width fabric bolt and one for a 60-inch width fabric bolt. Determine the width of the fabric you will be using. Measure it, or it may be marked on the bolt. Match this fabric width with your size and style to find the number of yards needed for your project. If you are using a fabric that has nap, you will need to buy a little extra fabric. This includes velvet, corduroy, plaid and fabric with a one-way design. With these fabrics,you need to cut out your pattern pieces so that the fabric design matches up properly. Learn how to read sewing pattern directions and learn the sewing vocabulary words you'll encounter while reading the instructions.